From the moment we were introduced to young Jyn Erso, witness to her mother’s murder and father’s abduction, and then time jumped to the woman simply existing within her cell on the Imperial labor planet, Wobani, we have all wanted to view the bridge of her life that connected that initial moment to the next. Rebel Rising by Beth Revis is that bridge which begins with Saw Gerrera’s arrival on Lah’mu and ends with Jyn’s introduction to the rebel high command on Yavin IV. The path that Revis tracks for Jyn is a believable one that explains the transformation from fleeing child to highly skilled guerilla fighter. At its heart is Jyn’s constant longing for family, be it with Saw Gerrera and his partisans or new friends found along the way, to fill the void left behind by the loss of her parents. 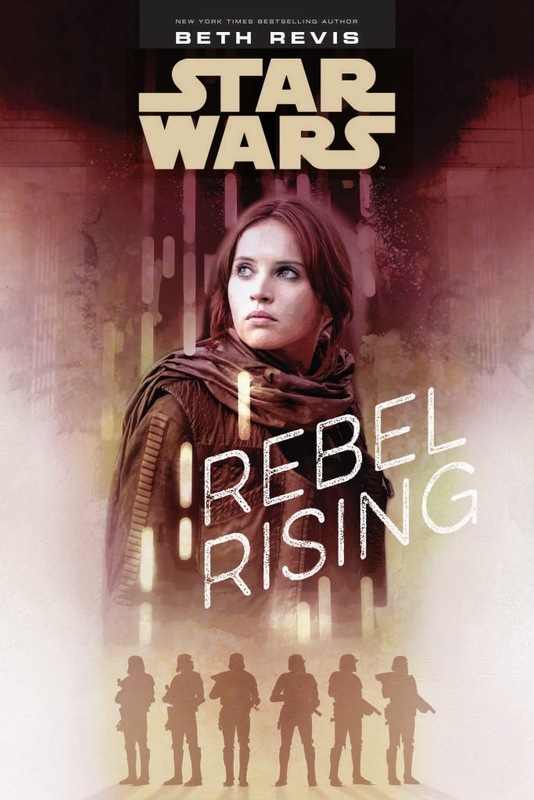 Rebel Rising joins Catalyst by James Luceno and the Rogue One novelization by Alexander Freed, as the trilogy of books which inform Jyn Erso’s life, and unfortunately, is not as engaging as either. It may be unfair to compare it to the other two, if only for that Rebel Rising has been written for the Young Adult audience in mind, whereas the others are novels without the limitations that genre requirements might impose. But for much of the novel, a sense of restraint lingered along every sentence and page, that an even greater story could have been told. With that said, Revis’ work is not bad, nor would average be a suitable descriptor for it. Rebel Rising is an enjoyable read, a suitable adventure for any reader interested not only in Jyn Erso’s journey but an exploration of the Star Wars universe at the time leading up to Rogue One. Revis brings the reader to multiple worlds in different stages of influence by the Empire, be it the wholesale mining and destruction of its communities to the general omninous creep of the Imperial industrial machine as it seeks a new planet to ruin and despoil. Also, for the first time in an unfortunately limited space, Revis offers a tantalizing alien perspective of the franchise’s overabundance of humans across the galaxy. Rebel Rising also adds depth to the relationship between Gererra and Erso, revealing what the Onderonian was willing to do to protect her identity, as well protect someone he had come to see as his daughter. By its conclusion, the reader knows well Jyn’s mettle, and can appreciate more fully her actions in her sole big screen appearance. For those who love the character of Jyn Erso, Rebel Rising is an essential, maybe the essential, source to read and understand her. For those who enjoyed the aforementioned novels which touched indirectly and directly upon her life, Beth Revis’ work is also recommended. Casual readers of Star Wars novels may or may not appreciate or fully enjoy the novel, if they are lukewarm to the character in the first place. Nonetheless, Rebel Rising is a certified Star Wars adventurer that will take you amongst the stars so far, far away, it just may do so in an underwhelming sense.